The three commas or mitsudome (三つ巴), distinguishing Accademia Romana Kendo Logo, birth in the Japanese culture, but they are intentionally represented with the colours of the Italian national flag. Their significance is usually interpreted as the representation of the division of the heart in three parts by the Shinto religion: the man, the earth and the sun. The symbol was associated to the Shintoist god of the war Hachiman and, for this reason, it was adopted as a traditional symbol by sword masters. The name "Accademia Romana" (Roman Academy) has been chosen for its different meanings: Accademia (Academy) as the place destined to training (from the Greek Akadémeia). Romana (Roman) both because it is located in Rome and, mainly, because of its tendency toward a "Roman" style. Style which is revealed in composure, courtesy, respect, virtus, costantia, fortitudo, discipline and humilitas. Peculiarities which are both patrimony of the values of our Latin ancestors and essential and characterizing traits of Japanese traditions; whereof Kendō is one of the most consistent modern manifestation. In Japanese language the name of the Accademia is rendered as "ローマ剣道研修会", according to the choice of our shihan Masashi Chiba Hanshi. That is "Roma (ローマ) Kendo (剣道) Kenshū (研修) Kai(会)". The real meaning of "Kenshū-Kai", as made clear by Master Masashi Chiba, is "association for the development of mind and body throughout the practice and the study of martial arts". Thus not only a sport club, but something which goes beyond, something which is involved in forming an individual both profoundly and outwardly. As explained in "Kendō no rinen": "The idea of Kendō is to discipline human nature throughout the application of the principles of Katana (sword)". 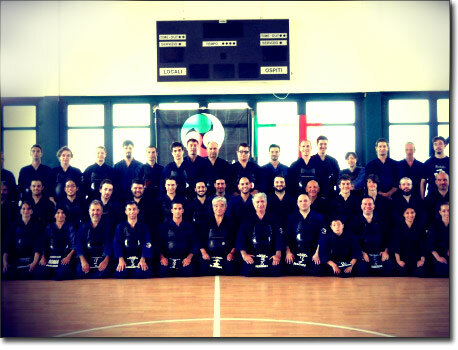 In the picture above: Accademia Romana Kendo in the grand room of the Dojo during Master Chiba's stage.